Early Texans looked to plants to cure what ailed them. Imagine a time in early Texas history when routine injuries and infections were life-threatening. A toothache, untreated, could cause fevers and delirium. A cold, allowed to linger, developed into pneumonia. A broken bone, poorly set and unable to heal, could result in permanent disability or require amputation. Common diseases we recognize and treat today such as hypertension and diabetes went unattended, often leading the patient to an early grave. Ancestral Texans turned to the only defense against suffering available — a plant pharmacopoeia passed down through the ages and carried with them as they migrated west from Europe and north from Mexico. Before the advent of modern medical practices, Texans looked to the natural world for help in maintaining their health and well-being. Native plants were a primary source for these palliative solutions, and the administration of “cures” was occasionally performed by early Texans known as curanderos. Curanderos were recognized within their communities as healers who addressed the vast list of undiagnosed ills suffered by indigenous and pioneer Texans. Like the medicine men of Native American tribes, curanderos used both nature and religion in their work, employing rudimentary practices of infusions and extractions combined with superstitious beliefs to bring relief to the sick, injured and malcontented. The pharmacological herbarium and the attendant cures used by the curanderos were derived from Renaissance Europeans, 16th century Aztecs and the 18th century inhabitants of New Spain. In fact, the earliest known documentation of medicinal plant use describes a diverse combination of remedies from different cultures around the world. Cultural forces played as much a part in a remedy’s application as its perceived effectiveness, with formal religious beliefs and spiritualism often performing the primary roles. Regardless of the culture, belief system or ingredient, these early remedies relied on the faith of the patient in order to work. One of our best-known Texas curanderos illustrated this again and again in his treatments. 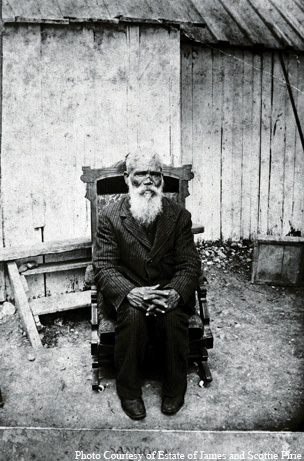 Don Pedrito Jaramillo, known throughout Texas as the “Healer of Los Olmos,” was born in Mexico in 1829. He came to Texas in 1881 after his mother died, residing on the Los Olmos Ranch near the soon-to-be-established town of Falfurrias. Legend has it that he became a healer after suffering a nose injury when he fell from a horse. He nursed his injury using mud from a stand of water, applying it repeatedly to his nose until the injury was healed. During this time, he claimed that God spoke to him and told him that he would become a curandero, or faith healer, which he did after the pain from his injury subsided. Pedrito’s use of natural infusions and emetics may have resolved the symptoms, if not the cause, of ailments, and as a result his services remained in demand until his death in 1907. Yet many of his cures involved simple repetitive acts, such as drinking a glass of water every day for a certain number of days. These remedies, designed to engage the patients actively in their own healing process, often generated a sense of well-being within patients, giving their bodies a greater chance of healing whether it was a sprain, a stomach virus or simply malaise. Healers could also be women, called curanderas, and West Texas’ Jewel Babb was a good example of our state’s unique, cross-cultural ethnobotanical history. Babb lived at the Indian Hot Springs along the state’s far western border with Mexico, treating patients with baths, massage, simple herbal remedies and “visualization.” Babb believed in using natural methods that treated the whole person, both physically and psychologically, and garnered a regular following on both sides of the border. “Ritualized” healing with plants has been around for centuries. But do plants really have the capacity to heal? And are the results truly curative or are they only palliative, much in the same way that a placebo works or an aspirin may help relieve arthritis pain but not eliminate its source? A typical argument is often made that all of our pharmacology is derived from nature and that therefore nature, rather than science, is the best course for a cure. But a plant is a highly complex organism, made up of many chemical compounds. Called metabolites, some of these organic compounds are toxic to humans while others are used in antiseptics and antibiotics. They appear in different parts of the plant at different times of the year, in variable concentrations, and are also dependent on the chemistry present in the surrounding environment. More complex yet, metabolite content changes according to species. So to suggest that a simple cup of boiled acacia will cure stomach pain is somewhat misleading. There are about a dozen acacia species in Texas alone (and many more varieties). Several of them can be found in the plant pharmacopeia but are used in different remedies by different cultures to cure or alleviate different ailments. In addition, it is problematic to suggest that a particular metabolite can be retrieved from a plant’s chemistry and reduced or magnified to achieve an appropriate dose necessary to alleviate symptoms, or cure a disease, simply by boiling a plant in water. So does drinking a cup of infused acacia flowers calm the stomach? Some folks swear by it, emphasizing the problem inherent in the use of plants for medicinal purposes — our evidence for healing with plants comes from anecdotal sources rather than from systematic scientific investigation. Thus, detached from its cultural significance, healing with plants is not a medically approved prescription for treatment. While some aspects of healing through nature have led to a deeper appreciation for our natural world, other practices have resulted in less desirable consequences. The international market for plants and animal parts for use in traditional medicine is responsible for the dramatic decline of many of the threatened and endangered species across the globe. In addition, the U.S. is the No. 1 importer of hundreds of non-native species of plants and animals — live and in parts — in order to meet a variety of consumer desires, from pets to home remedies. Our expanding natural health and wellness industry plays a part in this trend. We have seen in the last 30 years a multibillion-dollar industry grow out of the use of plants as treatment for illnesses, including products that do not undergo rigorous scientific tests and thus are not regulated by the Food and Drug Administration. Real biomedical benefits could possibly be derived from plant remedies, yet treatments lack scientific scrutiny, relegating them to the realm of folklore. But an absence of proof today doesn’t diminish the importance of the ethnobotany enriching our Texas past. Instead, this history illustrates the astuteness and industry employed by our ancestors in the face of extreme adversity and their supreme desire to alleviate suffering. In this light, the practice proved to be both a necessity and a triumph. • Whitethorn acacia (Acacia constricta). Folklore: Used to treat diarrhea and stomach ailments. Fact: Contains tannin, a compound used to tan leather. • Lechuguilla (Agave lechuguilla). Folklore: Sap, in a poultice, is used for kidney problems. 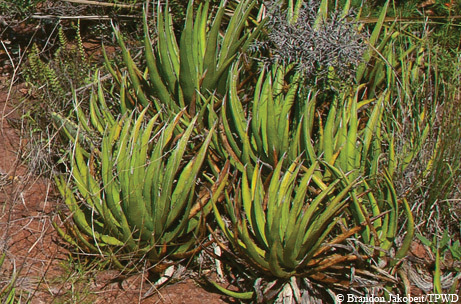 Fact: Agaves contain bactericidal polysaccharides that may aid in wound treatment. 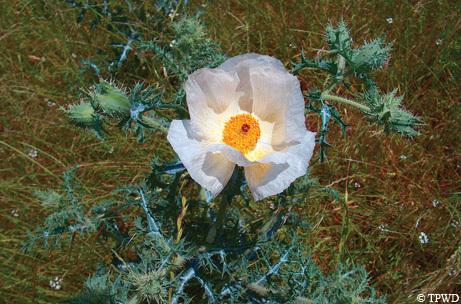 • Prickly poppy (Argemone mexicana). Folklore: Seeds, ground and mixed in water, were used as a purgative. Fact: A narcotic. Consumption of the seeds has caused fatalities. • Chiltepín (Capsicum annuum var. aviculare). Folklore: For stomach ailments and headaches and in a liniment for rheumatism. Fact: Capsaicin, contained in the fruit, is one of few examples of the FDA’s approving an ingredient derived from a medicinal plant. Used in cream for the treatment of pain. • Creosote bush (Larrea tridentata). Folklore: For use as a dandruff treatment and body deodorant. Fact: Contains a powerful antioxidant.